To report visual and refractive results in radial keratotomy (RK) patients that underwent a cataract surgery with a monofocal intraocular lens (IOL) implantation with 1 year of follow-up. Twenty-eight eyes of 15 patients with cataract and the previous RK were included. All eyes underwent phacoemulsification and monofocal IOL implantation. IOL power calculation was done using the Double-K formula of Aramberri. 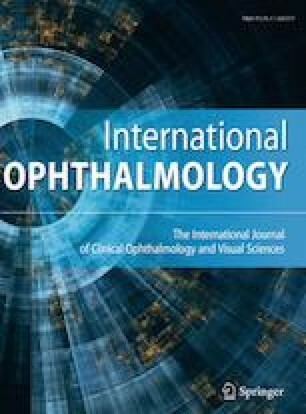 The preoperative versus postoperative corrected distance visual acuity (CDVA) and the uncorrected distance visual acuity (UDVA) values were used to assess the efficacy and safety of the surgery; meanwhile, the achieved versus the expected refractive outcomes postoperatively were used to assess the predictability. Phacoemulsification and IOL implantation was performed successfully in all eyes, and no intra- and postoperative problems occurred. The mean logMAR UDVA significantly improved from 0.7 ± 0.3 to 0.4 ± 0.2 at 6 months, and 0.3 ± 0.2 at 12 months postoperatively. By the end of the follow-up period, about 60% of the eyes achieved 20/25 or better CDVA, 25% of the eyes gained three or more lines of visual acuity, and two eyes had lost one or more lines of visual acuity. The mean spherical equivalent improved from − 1 ± 6.00 to − 0.75 ± 1.1 D by the end of the follow-up, and about 60% of the eyes were within ± 1 D at 12 months after the surgery. No intra- and postoperative problems occurred. Pseudophakic monofocal IOL implantation offers good visual acuity recovery and acceptable refractive correction in RK patients after 1-year follow-up.